Boney Kapoor is venturing into the Tamil industry with Nerkonda Paarvai, a remake of the Hindi film Pink. The original film starred veteran actor Amitabh Bachchan in the lead. When it was announced that Ajith Kumar would be featured in the remake, this piece of information was more than enough to make fans happier. The big news is, Boney Kapoor has offered three action scripts to Thala Ajith (as he is fondly called) and he wants the latter to say a yes to one of the scripts. 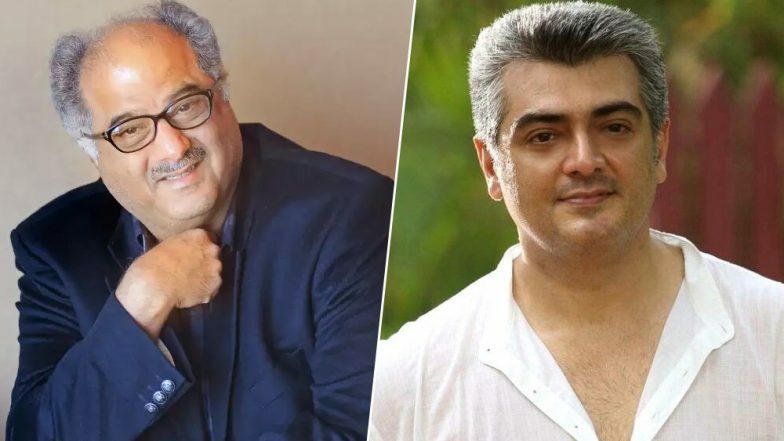 So is Boney Kapoor planning to do a Hindi film next with Ajith? Read details. Superstar Ajith Wraps Up Shoot of Pink Remake Nerkonda Paarvai. Boney Kapoor tweeted saying he has watched the rushes of Nerkonda Paarvai and he’s happy with Ajith Kumar’s performance. There were few pictures that leaked online from the sets of Nerkonda Paarvai and the movie fanatics were happy to see the lead actor’s avatar. The producer wrote, “Saw the rushes of #NerkondaPaaravai. Happy... What a performance by Ajith.... I hope he agrees to do Hindi films soon. Have 3 action scripts, hope he says yes to atleast one of them. #NerkondaPaaravai #Ajithkumar”. So will Ajith agree to do a Hindi film? Did Ajith Kumar Get Rid of His Beard for Nerkonda Paarvai? Actor’s New Look LEAKED Online – See Pic Inside. For those who don’t know, Ajith Kumar has played a brief antagonistic role in Shah Rukh Khan and Kareena Kapoor Khan starrer, Aśoka, that released in 2001. There is no doubt that fans are eagerly looking forward to see Thala Ajith in a Hindi film. Talking about Nerkonda Paarvai, the film directed by H. Vinoth, it also features Bollywood actress Vidya Balan in pivotal roles. Stay tuned for further updates.